Several members of the NIU Geography Department traveled to Champaign, Illinois this month to participate in the Spring 2009 Illinois Geographic Information Systems Association (ILGISA) conference. ILGISA seeks to advance the understanding, development and effectiveness of GIS by facilitating dialog among a wide range of GIS practitioners including students, academics and private and public professionals. ILGISA's biannual conferences provide opportunities to make these connections via poster exhibitions, workshops and other knowledge sharing sessions. 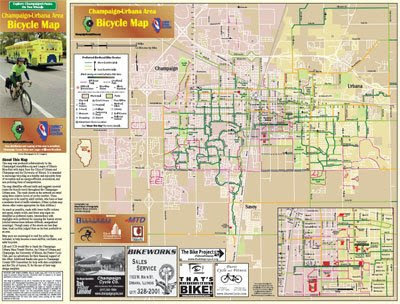 Leonard Walther's award-winning Champaign-Urbana Area Bicycle Map (PDF) created for the League of Illinois Bicyclists. An important component of the ILGISA gatherings is the recognition of individuals for their scholastic and professional work. We are proud that NIU Geography received four awards during the Spring 2009 conference, namely: (1) Jennifer Outcalt (left) received the ILGISA Outstanding Student Achievement Award; (2) Cynthia Vogel, NIU undergraduate student, won the ILGISA Student Paper Competition; (3) Zach Schmitt, NIU graduate student, won the ILGISA Student Poster Competition; and (4) Leonard Walther, NIU Geography Cartographer, won the ILGISA Professional Map Competition. In addition, Jeremy Spencer and Assistant Professor Scott Smith presented their work at the conference this spring. Congratulations and thanks for participating! Zach Schmitt (left) stands next to his award-winning poster, Seasonal Variations of Population Exposure to Sulfur Dioxide in the Chicagoland Area; Jeremy Spencer (right) with his poster Winter Weather Fatalities in the Coterminous United States: 1993-2007.